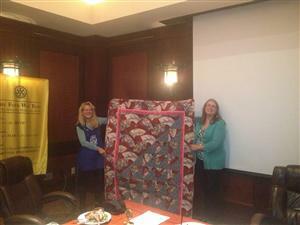 Many thanks to both Rebecca Reichlin & Sue Liebner who Quilted for Polio Eradication. Their donations went to the 2013 Zone Institute held September 18-22 to be auctioned off to benefit the polio eradication program. The beautiful quilt diplayed in this photo was crafted by Rebecca Reichlin.